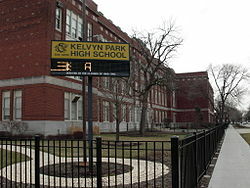 Kelvyn Park High School sits on the corner of Wrightwood and Kostner Avenue in the Hermosa community on the northwest side. Being a neighborhood school in the Chicago Public Schools (CPS) means being subjected to budget cuts, while being demonized for not being as “high-performing” as better-funded schools. In my own community, Kelvyn Park High School (KPHS) has been hit particularly hard this year. For the 2015-2016, KPHS will lose over $2 million—one of the biggest budget decreases in the entire school system. Budget cuts are unfortunately not an unusual occurrence for Kelvyn Park. In 2013, CPS cut the school’s budget by 27%. While CPS decreases its budget, CPS decided it was a good idea to add seventh and eighth grade students in 2014. This happened as a result of the conversion of Ames Middle School to a military school in the same year (which is another example of CPS stripping our communities of neighborhood schools). In an ideal school system, schools like Kelvyn Park would be prioritized, not undermined and attacked as they currently are. Applying to high schools in elementary school is a complicated process with no guarantee of acceptance to one of the coveted selective-enrollment schools in the city. Geography, income level, and education background all impacts your access to the resource-rich schools. Neighborhood high schools should be a way to guarantee a high-quality education to all, regardless of background or prior test scores. Unfortunately, CPS operates under the philosophy that a high-quality education is not a right, but a privilege. Protecting and funding our neighborhood schools is a way to fight back against that vision. For my family, neighborhood schools have been particularly important. My two brothers went to Kelvyn Park High School and I saw the different ways the school supported them. When my second-oldest brother entered high school, he instantly became involved in volunteerism and co-curricular activities. I saw him build a family within the school and I could safely say that he thrived during those years. For my oldest brother, I saw the different hoops teachers would jump through to help him succeed. I can’t say my brothers received the highest-quality academic education (a school can only do so much when it is underfunded and understaffed), but I saw what the staff members would do with limited resources. It is a testament to the strength of our teachers and students when a system is constantly working against them but they are resilient. If KPHS were adequately funded, I can only imagine the greater impact it could have on its students and the larger community because KPHS is not an underperforming school, it is an under-resourced one. CPS too often frames the conversation around our neighborhood schools when the top officials have seldom set foot into those schools. The terms “underperforming” and “under-enrollment” are used to justify slashing budgets. Vague terms are thrown around, but the stories and voices of students, teachers, and community members impacted are never heard. I read a powerful post this morning on the Logan Square Neighborhood Association page about CPS’ constant attack on Kelvyn Park, which shares stories of those affected. We all need to work tirelessly to uplift those stories because otherwise the damage CPS inflicts is hidden. More importantly, it allows us to share why our schools matter. All across the city, people are fighting back to protect our neighborhood schools. Let’s make sure the northwest side joins this fight.